I'm joining some of my favorite Disney Blogging Friends today to celebrate the birthday of everyone's favorite quacker - Donald Duck!! 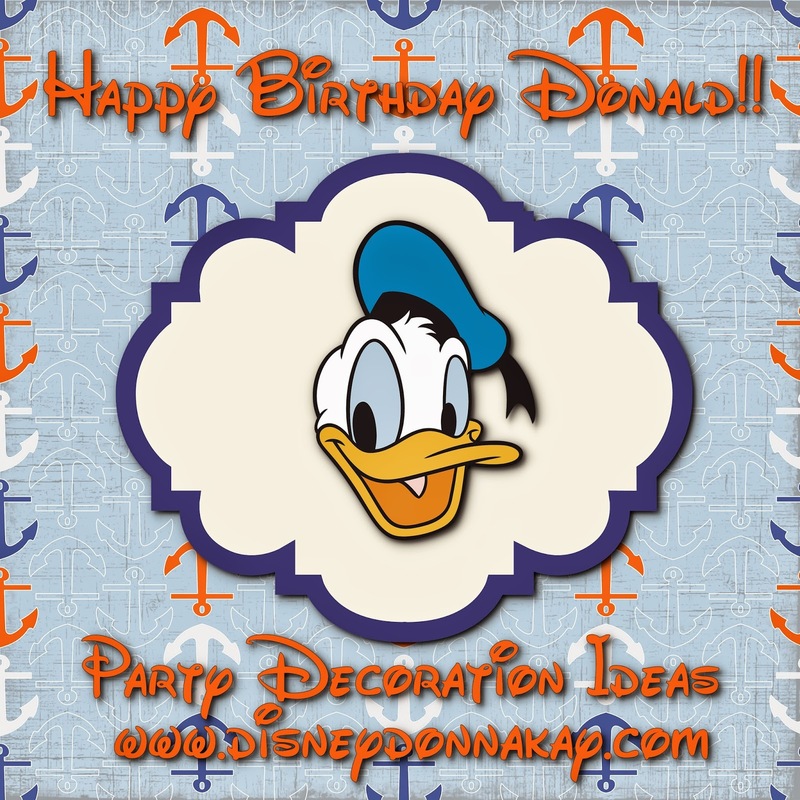 Please feel free to hop on board with us and share your Donald Duck birthday party ideas!! First an overview - for me color plays a large part in setting the mood for your party. 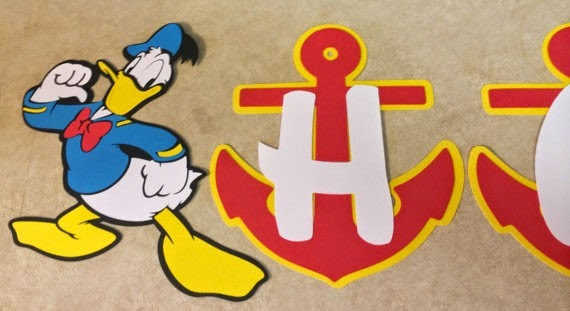 For a Donald Duck themed party I would choose: Blue, White, Yellow, Red. In leiu of having Donald Duck pictures all over the room you can add reminders of him with sailor hats, feathers, red bows - you get the idea. Also add fun food ideas like "Cheese & Quackers" or "Donald's Dunkers" to the food table. But most of all have fun!! I love this cute anchor themed banner I found on Etsy, it really sets the tone for your party! Go for the unexpected. 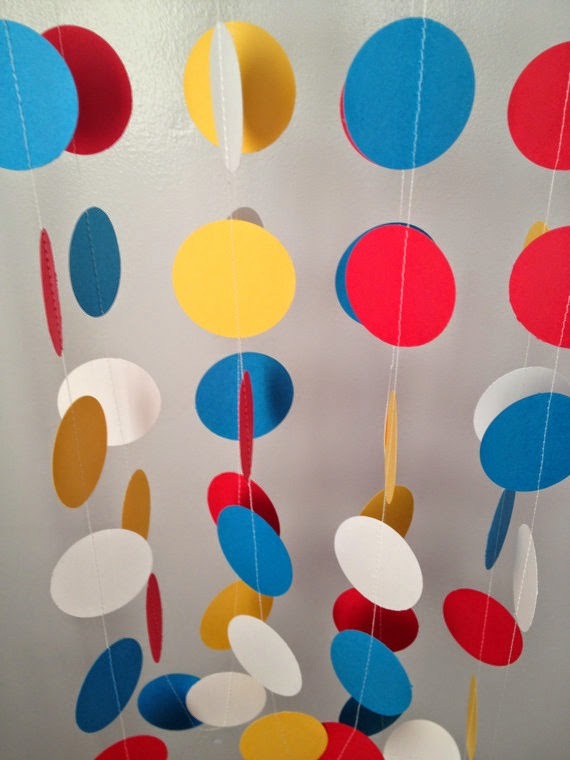 I think these simlple and colorful circles would make a fabulous backdrop for your food table. They say Donald Duck without having his picture all over the place. I also love placing Donald Duck toys or Little Golden Books around the room as a fun a sublte nod to today's birthday boy. This food table is so cute (I love the life preserver)! 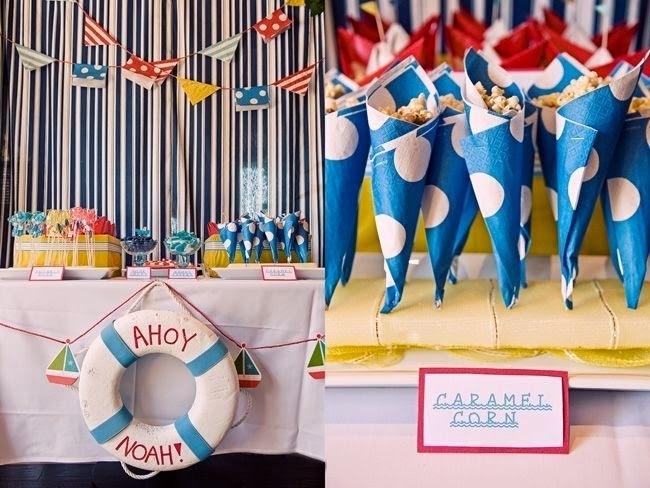 It is full of fun details like the flag banner behind the table, and the popcorn cones are such a fun colorful addition to the table. When searching for ideas to pin for your party don't forget to search similar terms. I found this one by searching for "sailor party table", unfortunately I am not sure who to credit for this cute table since the pin only went to an uploaded photo. Lastly, don't forget your food can double as decoration! 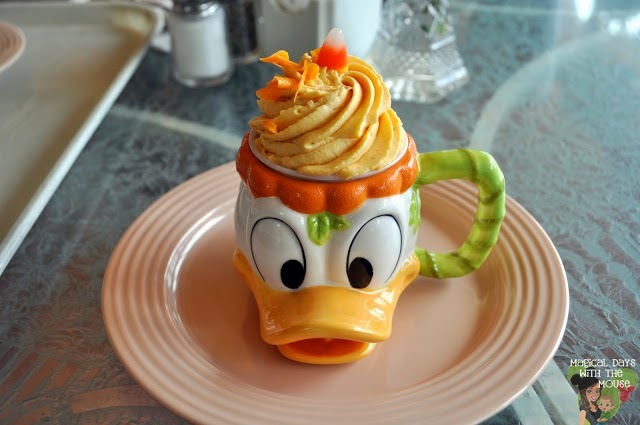 I think a place setting that includes a Donald Duck mug filled with a cupcake makes an adorable addition to the table decor as well as a yummy treat!! I hope you have enjoyed my Donald Duck Birthday Party ideas!! If you use any of them be sure to share them here in the comments or on the Disney Donna Kay Facebook Page! A big Thank You to my friend Deb of Focused on the Magic for hosting this fun Blog Hop. If you are a blogger be sure to join in on the fun by using the link below!! Love these ideas! I never would have thought of putting a cupcake in a mug! What a great idea! I'll have to remember that for my next party! Today's take-away? Use colorful food as decoration! I'm all for double duty whenever possible. Thank you Teach!! You're welcome Donna!! Be watching for another lesson coming soon!! Love all the great ideas - that old toy is awesome. The popcorn holders are a great idea! I loved it!! 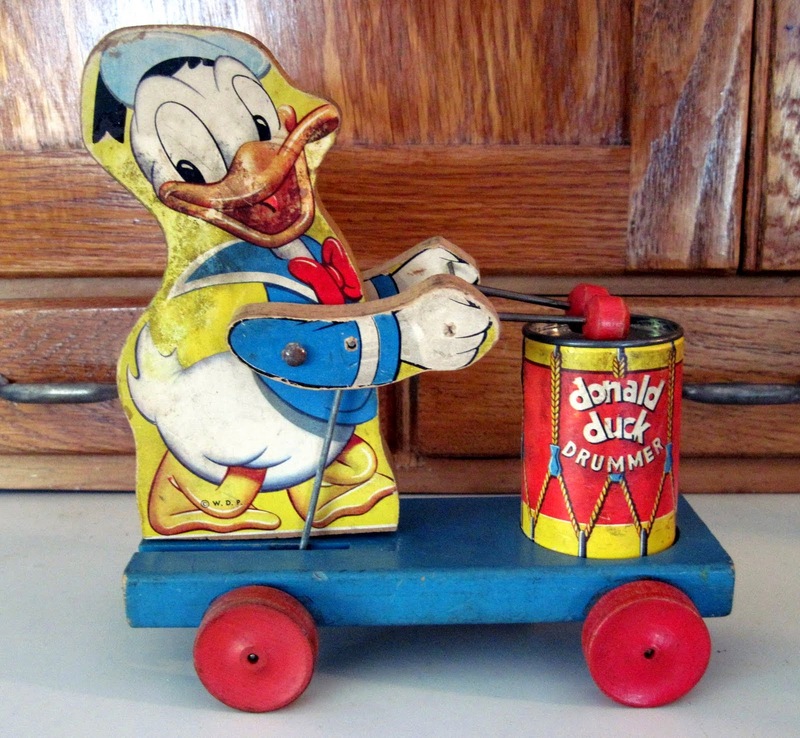 I'm a stickler for old toys like this one, and especially anything with Mickey or Minnie. Thanks Amy!! A Donald Duck party would be so much fun, I love all the bright colors. Thanks for stopping by Deb, and for hosting the hop! It was lots of fun and I got some great party ideas!! Great tips! I love the idea of using what you have at home to decorate for a party. It's such a budget friendly way to celebrate. Thanks for sharing these festive decorations. Thanks Lisa! You always have such wonderful parties, I'm jealous!! Donna..those are SO cute! Love the idea of the nautical them and the colors! Great post for a Donald Party! I totally want to have a Donald Duck party now! Cindy, one day we are all going to meet up at Disney and I am going to plan the biggest Disney party ever! I can't wait!! So many fantastic unique ideas! !